Mr. Cottage and I took a little ride over the river and through the woods. 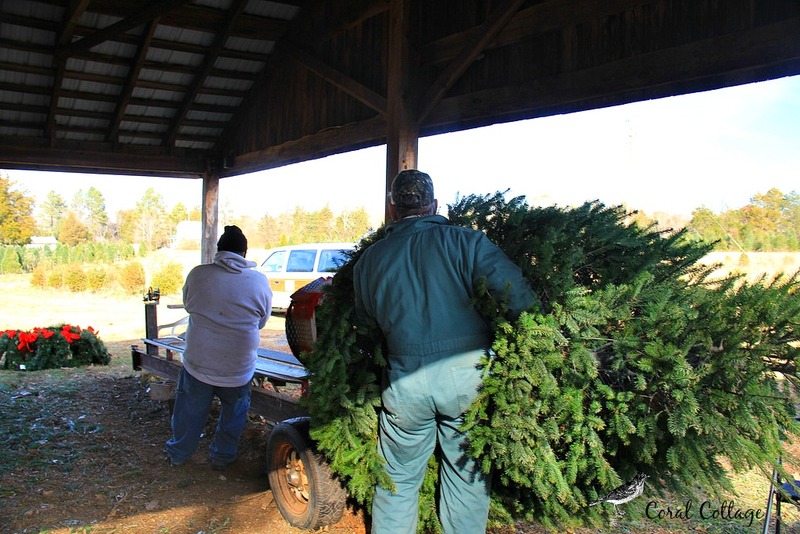 We arrived at Foxfire Christmas tree farm. They have been in business for thirty years. 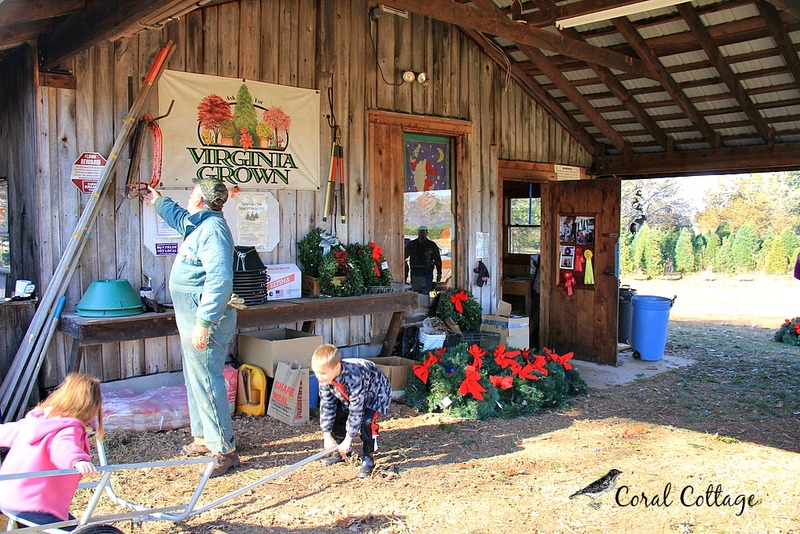 Way back in the day Father Cottage was an advisor for the Virginia Christmas tree growers association and worked with this farm. 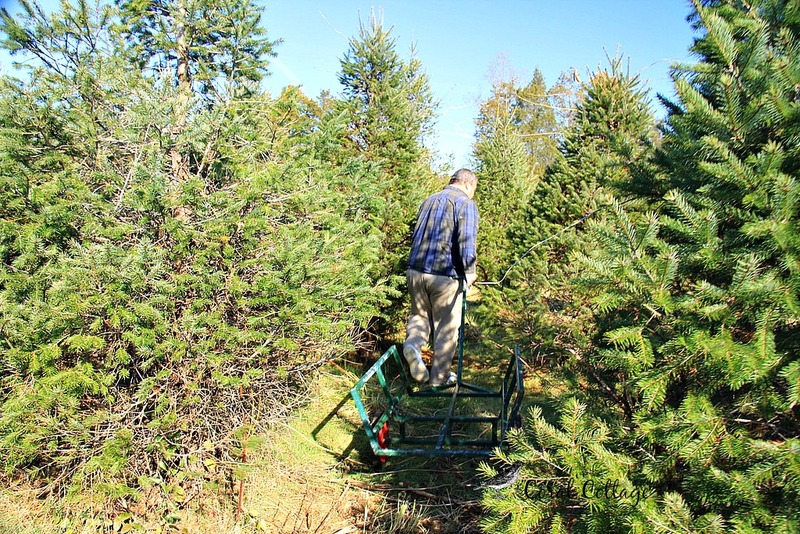 The owner supplies a saw and cart to haul the tree in and points us in the direction of the Douglas Firs, after confirming what type of tree we are after. Mr. Cottage watches as people claim the tree he thought was the one. He kinda looked like a kid that had his toy taken away from him. So off we go through the rows and rows of beautiful trees, but just not the right one. There were several people there with their dogs. When she was alive, we used to take our dog Cookout with us to get a tree. She always picked the tree for us, it was the one that had a nest in it. How did that dog always know? My heart felt a little twinge of those days past when I spied this nest. I’ve been longing for a puppy or two for a while. 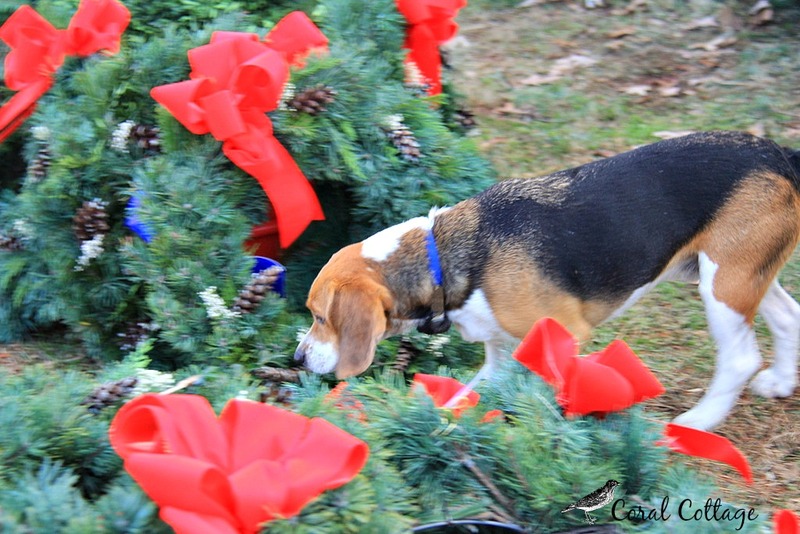 We head back to the barn to pay for our tree and enjoy some sights. This is our magnificent tree getting bundled up for transportation. Many years ago before Mr. Cottage went into business for himself, he worked for the Virginia Department of Forestry. 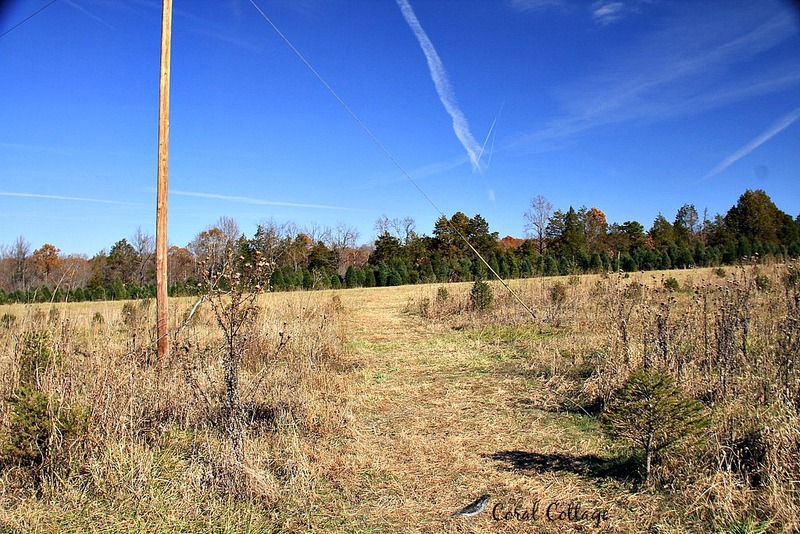 Having both Father and Mr. Cottage working for the Forestry department, provided us with the access and the know-how; we entertained the idea of starting our own Christmas tree farm. Recently while I’ve been re-imagining our life, I’ve entertained that thought again. This year over 37 million American families will celebrate the holidays with the fragrance and beauty of a real Christmas tree. The tree, used as a symbol of life, is a tradition older than Christianity and not exclusive to any one religion. It’s a part of our holiday customs that engages not only our senses of sight, touch, and smell, but also our sense of tradition, hope and good will. Long before there was a Christmas, Egyptians brought green palm branches into their homes on the shortest day of the year in December as a symbol of life’s triumph over death. Romans adorned their homes with evergreens during Saturnalia, a winter festival in honor of Saturnus, their god of agriculture. Druid priests decorated oak trees with golden apples for their winter solstice festivities. In the middle ages, the Paradise tree, an evergreen hung with red apples, was the symbol of the feast of Adam and Eve held on December 24th. The first recorded reference to the Christmas tree dates back to the 16th century. In Strasbourg, Germany (now part of France), families both rich and poor decorated fir trees with colored paper, fruits and sweets. 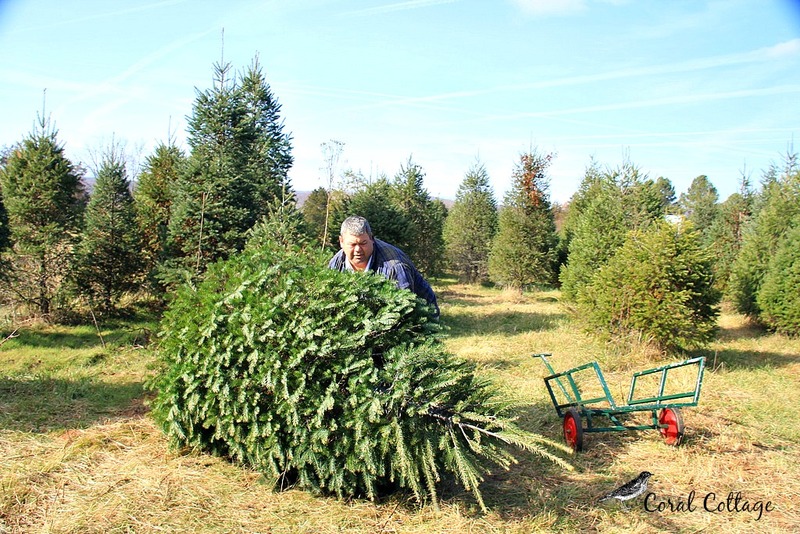 The retail Christmas tree lot also dates back that far – in those times, older women would sell trees harvested from nearby forests. The tradition spread through Europe and was brought to the United States by German settlers and by Hessian mercenaries paid to fight in the Revolutionary War. In 1804 U.S. soldiers stationed at Fort Dearborn (now Chicago) hauled trees from surrounding woods to their barracks at Christmas. The popularity of the Christmas tree then proliferated. 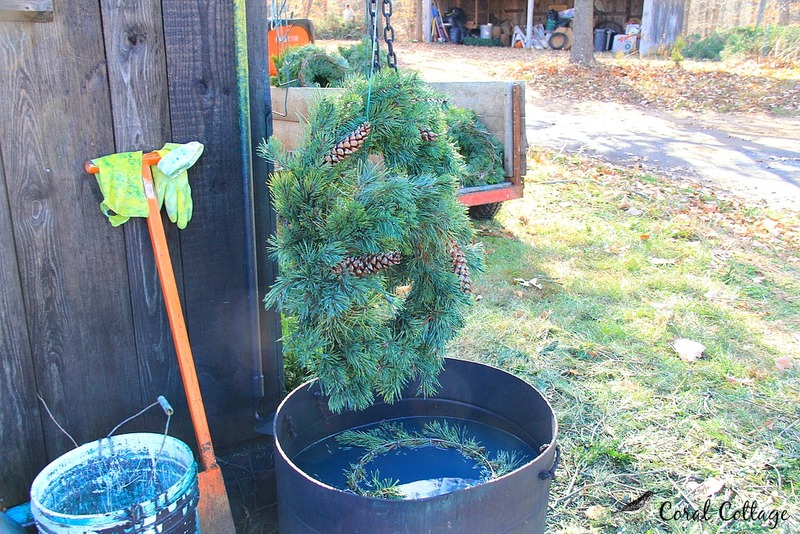 Charles Minnegrode introduced the custom of decorating trees in Williamsburg, Virginia in 1842. In 1851, Mark Carr hauled two ox sleds loaded with trees from the Catskills to the streets of New York and opened the first retail lot in the United States. Franklin Pierce, our 14th President, brought the Christmas tree tradition to the White House. In 1923, President Calvin Coolidge started the National Christmas Tree Lighting Ceremony now held every year on the White House lawn. Do you have a live tree or an artificial one? If you have a live tree what is your favorite variety? Mine has always been the Fraser Fir. 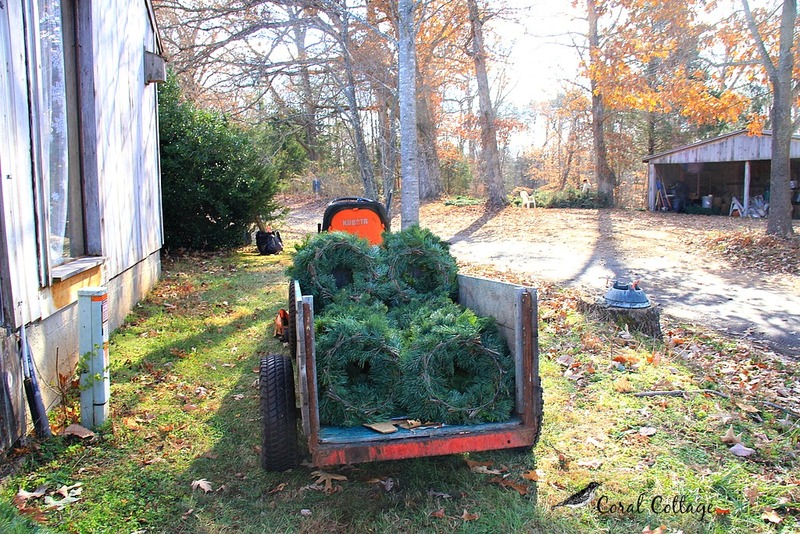 Kim of Red Dirt Farm • This entry was posted in Country living, folklore, Uncategorized and tagged buckingham, christmas, Christmas tree, christmas tree farm, christmas tree folklore, Christmas tree tradition, Christmas trees, coral cottage, cut your own christmas tree, foxfire farm, magnificent tree, Palmyra, virginia, virginia christmas tree growers association. Bookmark the permalink. Beautiful photos! We have always had a beautiful fresh live tree. A few years it has fallen down fully decorated. Mostly, we have had lovely trees without any unfortunate shenanigans. Last year it died after 3 days and we celebrated Christmas with a dead tree. I said I would not have a live tree again after that. 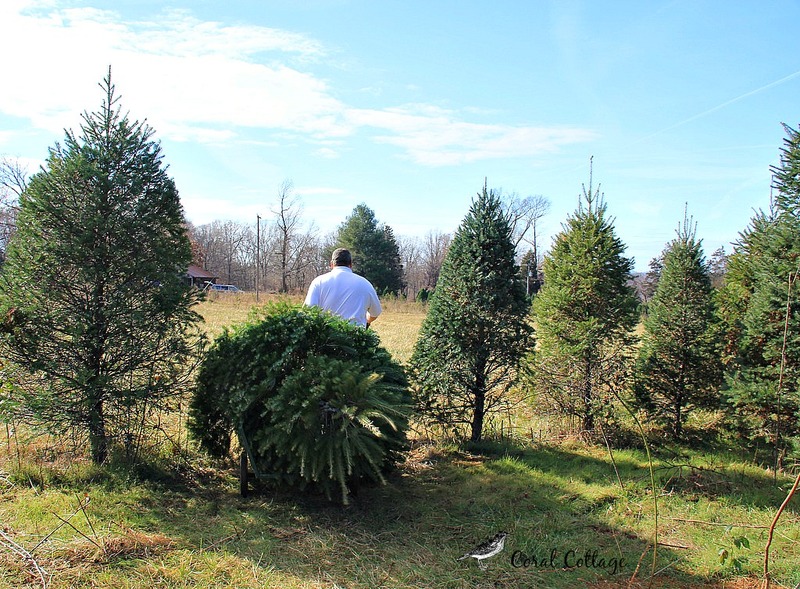 However, I can’t imagine not having a lovely scented live tree and so next week I will head out on our traditional hunt for the perfect live Christmas tree. Who knows what will happen this year? Enjoy your tree and the season!! We have have lost several trees over the years – crashing to the floor. Of course it was because a cat or two decided to climb it. I’ve lost a lot of ornaments that way. The big tree your folks had when we were growing up was always the standard for the wow factor. I finally got a really really big tree this year. I love it! Happy season to you and yours too. Lots of hugs. Thanks a bunch, Mrs. Cottage, for the Christmas tree folklore. ‘Twas really interesting. My pleasure. I like those factoids. I just rarely remember them. 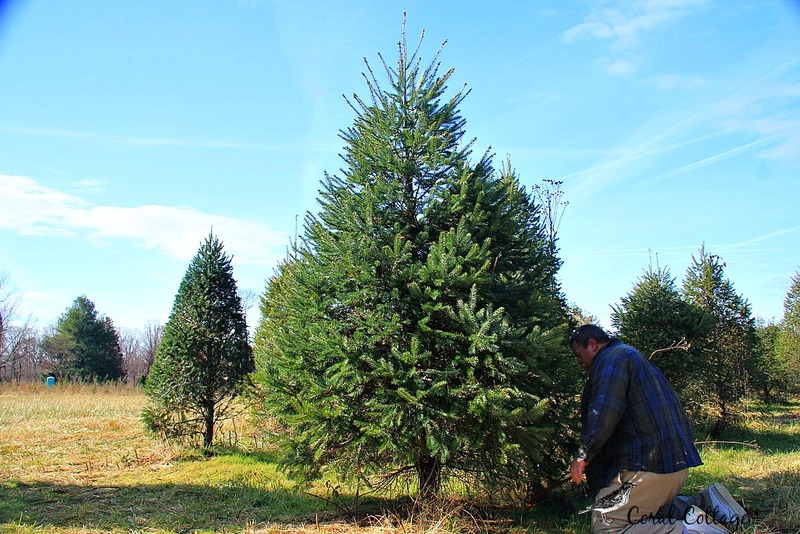 Thanks for sharing your photos and day with us, as well as the history of the Christmas tree. I do love a tree decorated with special family ornaments and lights. Merry Christmas! Thanks so much, Kim. I wish you and your family the same. The official Virginia Governor’s Christmas tree was supplied by John and Virginia Carroll of Louisa. John was formerly the Assistant State Forester. This was particularly significant because this year is the 100th anniversary of the Department of Forestry. During those years it was called the Virginia Forest Service, the Virginia Division of Forestry and now the Virginia Department of Forestry. It was always the same organization, only the name changed, along with its status in the state organizational structure. I’m still proud to have served 40 years with the organization. I love Christmas Tree Farms. We are lucky to have one very close by that our family has went to for years to find our Christmas Tree. 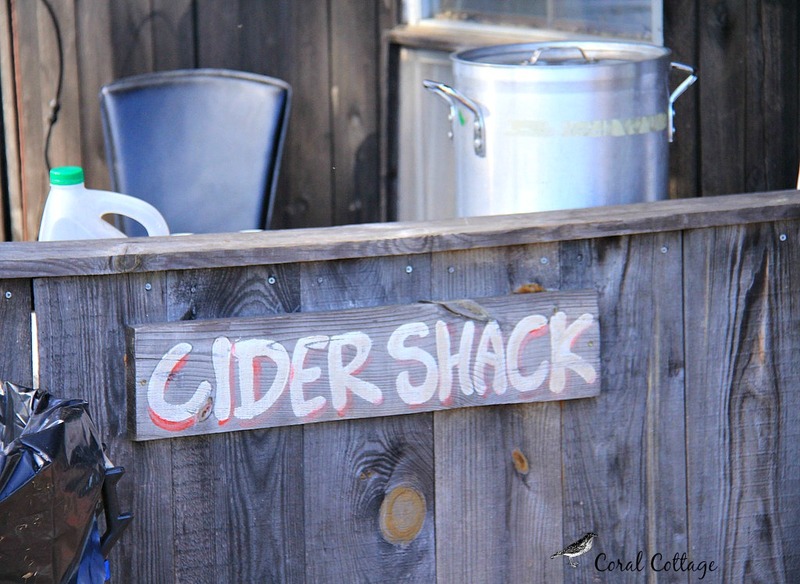 The text, images, and designs on this blog are the sole property of Kim Critzer and Red Dirt Cottage and protected by copyright law. Do not copy, reproduce, or represent any content without the expressed written permission from the owner. Thank you. My response to my love of nature, my garden and local walks with my dogs. the news from Dry Creek . . . The Inquisitive Makeup Artist and I have questions!